Now that we’re having more sunshine, and there is daylight when I leave the house and when I get home, I’ve been shaking up my skincare a little bit. First up is my morning routine – I love chatting all things skincare, and it’s something I dedicate a lot of time to so it seemed apt. The first thing I do is wash my face with either the Oskia Renaissance cleansing gel or the Origins make a difference cleansing milk. 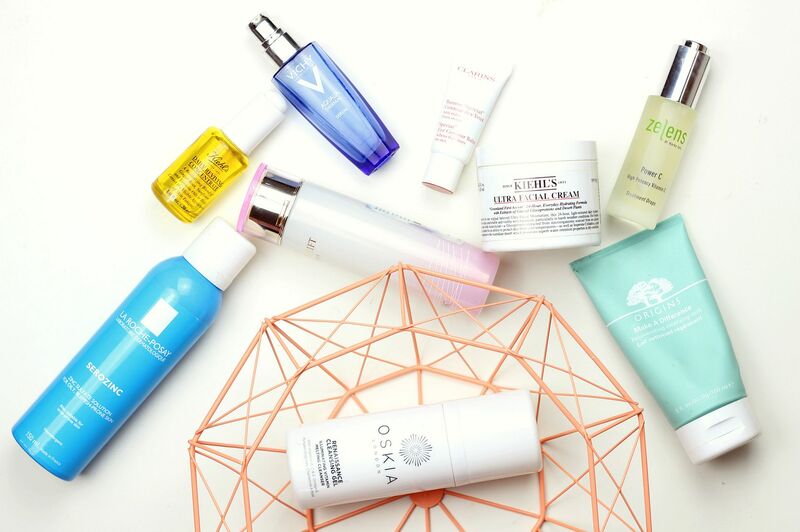 I opt for the Oskia if my skin is feeling drier, or looks especially in need of a boost. I find that it suits my skin, and the texture is my favourite – it’s an oily balm that melts into something lighter on the skin. I always use a hot flannel to rinse off my cleanser. The Origins milk is a really light milk that hydrates but doesn’t interfere with the skin too much so it’s the one I go for when my skin is feeling nice in the morning. After cleansing, I use the DHC beauty lift toner. Toner is a marmite skincare product – I personally really like it because it makes my skin feel fresher and softer. The DHC one in particular is really moisturising. If my skin is feeling sore or hot, I always reach for Serozinc as well. After toning, I apply 3-4 drops of the Kiehl’s daily reviving concentrate and spend a minute patting it in. I am especially enjoying this at the moment, because I always like to use an oil in the morning but this one isn’t too heavy so it’s perfect as it’s starting to get sunnier. About ten minutes later I apply a little mix of the Vichy aqualia serum with the Zelens vitamin C treatment drops, before applying a liberal amount of the Kiehl’s ultra facial cream. I find this cream to be so lovely on the skin – I thought it wouldn’t be enough for my skin because it’s so lightweight but it’s really hydrating and leaves my skin smooth and prepped for makeup. My last step is the Clarins balm for dry skin because my eyes are so dry! I need all the help I can get. I also apply the La Roche Posay anthelios (best sunscreen) as my final step, which I helpfully forgot to photograph. What’s your skincare routine at the moment? Is cream contour worth it?